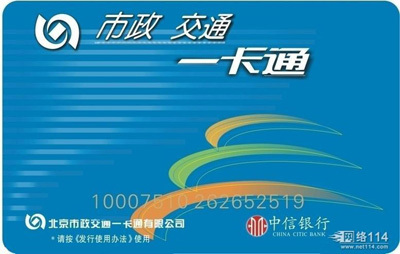 Two in three people in Beijing now have the card. About 23,000 public buses run on nearly 700 routes in Beijing. With IC card (gongjiao yikatong,traffic cards to take public buses and subways), adults may enjoy a discount of 60 percent and students a discount of 80 percent. Generally, the buses operate between 6 am and 10 pm to midnight. Their frequency varies but a bus should arrive every five to ten minutes. The Beijing Subway has seen unprecedented construction in recent years, greatly easing traffic congestion in the Chinese capital. By the end of 2013, the city boasts a network of 20 lines, covering 11 districts. The Beijing Subway is the busiest on the Chinese mainland in terms of passenger volume, and the largest in terms of operational length. It is estimated the total operational length of the Beijing system will reach 1,050 km by the end of 2020, with 30 lines and some 450 stations, according to the Beijing government. Subway/light-rail trains arrive every few minutes, generally speaking from 5:15 a.m. to 11:40 p.m. Route signs are bilingual; useful maps showing station exits are located at the center of every platform, and all stops are announced on the trains in English and Chinese. There are more than 67,000 taxis in Beijing. Taxis are a convenient way to get around Beijing. (1) Try to know where you're going; a map or a card with your destination is extremely helpful to the driver. (2) Carry small change; your driver may not be able to change a 100-yuan note. (3) Demand to use the taxi's meter. Sit in the front seat to make hand gestures more visible, being aware of the seat belt. Zuo guai means turn left, you guai right. (4) Say "tingche" to stop. Ask for your receipt by saying "fapiao". (1) Use the expressway and main roads of the Second, Third, Fourth and Fifth Ring roads. (2) Traffic jams are the norm; expect them at almost any time of the day. (3) There are different levels of parking fees in Beijing. Using roadside parking spaces in Beijing's 13 areas, namely, Beijing Railway Station, Beijing West Railway Station, Dongzhimen Dongzhong Jie, Yansha, Cuiwei, Wangfujing-Dongdan Commerce Area, Xidan Commercial Area, Financial Street, Chaowai Commercial Area, CBD (Central Business District), Zhongguancun Xiqu, Chongwai Commercial Area and the Qianmen Commercial Area, drivers should pay 5 yuan per half-hour. (4) You can also visit http://www.bjjtgl.gov.cn to get detailed real-time traffic information in Beijing. If you don't want to drive in Beijing, you can rent a car and driver for a very reasonable fee. On the other hand, if you possess the necessary documents, you can rent and drive yourself. The flexible business environment of Beijing offers affordable and convenient car rentals complete with skilled and bilingual drivers. What better way to attend a punishing string of meetings around town, or to show a visiting colleague the wonders of the Great Wall? Beijing Zhongyuan Car Rentals (+86 10 8448 3366), cars with driver available from 400-1,300 yuan per day. For long-term rentals with a driver, try the local English-speaking specialist, Beijing Anji Station Car Rentals. They will even buy a new vehicle if your requirements are for two years or more. 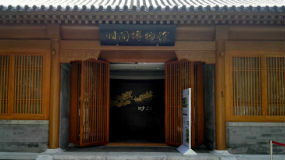 You can also visit http://www.taxi-beijing.com for more information. The "Aerial Gateway to Beijing", Beijing Capital International Airport (BCIA) is the first airport in China with three terminals, two towers and three runways. With a current annual passenger throughput of 65 million passengers, BCIA operates more than 200 international and domestic aviation routes, connecting with nearly every major country, region and city in the world. Beijing Capital International Airport is located northeast of the city, 25.35 kilometers from Tian'anmen. Passengers can travel to the airport by subway, taxi or shuttle. The 28.1-kilometer Airport Express Line, with four stations (Dongzhimen, Sanyuanqiao, T2 and T3), makes the entire trip from Dongzhimen to the airport in as little as 16 minutes (with a ticket costing 25 yuan or $3.68). Taking a taxi from the center of the city to the airport may cost about 85-100 yuan. Alternatively, passengers may take the airport shuttle bus from Xidan, Beijing Railway Station, Gongzhufen, Fangzhuang, Zhongguancun and some other locations at a cost of 16 yuan. The shuttles normally run daily from 5:30 am to 9 pm every 15 minutes. Flights at Beijing Capital International Airport operate out of terminals T1, T2 and T3. Passengers should be certain in advance about which terminal they should use; the information is included on flight tickets. For more information, passengers may log onto http://www.bcia.com.cn/ or dial +86 10 6454 1100. If you find yourself in the wrong terminal, take an available bus (free) to get to the correct terminal building. Also special shuttle cars that can ferry passengers to other terminals are available outside the terminals. Please approach your check-in counter with your ticket and valid ID ready. Check-in luggage and obtain your boarding pass. For passengers who do not need to check-in luggage, please proceed to the counter marked "Check-In Without Baggage". An electronic flight ticket counter is available for Airchina in the east of Zone F at the Domestic Departure Hall of T3. Payment or bookings can be processed for passengers with electronic air tickets only. For access to electronic air ticket services of other airlines, please consult the corresponding on-duty managers at the Departure Hall. Prepare your boarding pass, airline ticket and valid ID card in advance to present them to security personnel. To ensure the safety of your flight, passengers should go through security check, and hand-carried articles should be examined. After security check, you may wait for your flight at the boarding gate indicated on your boarding pass. The boarding procedure will begin 40 minutes (30 minutes for domestic flights) before departure. Please pay close attention to announcements. The boarding pass needs to be presented while boarding, please prepare it in advance. For additional information about the services available at Beijing Capital International Airport, please consult the information desks located in the main lobbies of the terminals. Services include: scheduled flights, flow for airplane boarding and related knowledge about boarding. Rail is the most commonly used transport mode for domestic long distance tours. As China's transport hub, Beijing has four major railway stations: Beijing Railway Station, Beijing West, Beijing South and Beijing North. Many bus routes serve these stations. Beijing Railway Station is an important hub for national railway transportation. Opened in the 1950s and covering an area of 25 hectares (61.8 acres), it became the biggest passenger transport station in 1959. The building was impressively grand, with a combination of rich traditional and modern-style architecture. It was considered one of the 10 great constructions in the capital during the 1950s. Beijing Railway Station is a top-grade national station that serves many lines, including Jingshan (Beijing to Shandong), Jingqin (Beijing to Shaanxi), Jinghu (Beijing to Shanghai), Jingcheng (Beijing to Chengde city of Hebei province), Jingyuan (Beijing to Shanxi) and Jingbao (Beijing to Baotou in the Inner Mongolia autonomous region). There are also international passenger trains that serve the Pyongyang, Ulan Bator and Moscow routes. Moreover, it also serves as a link between the inhabitants of the capital and the rest of the nation, as well as the Chinese people and the rest of the world. Beijing Railway Station is located right in the city center, just next to Jianguomen, and is within the confines of the city's Second Ring Road. It is located conveniently nearby public transportation. Numerous public buses and trains on subway Line 2 pass close to the station. There are subway stops adjacent to the station, and there are buses taking passengers to both the inner and outer city. The station itself can hold over 8,000 passengers at any time. Beijing West Railway Station was opened in early 1996 after three years of construction. Covering an area of 51 hectares, it is one of the largest railway stations in Asia. The whole building complex is designed in the shape of the Chinese character "品". Its operation commenced in October 1995. The station was expanded in 2000, establishing additional parking lots, and is now able to handle 300,000 passengers per day. Trains departing from Beijing West leave for destinations in central South China, South China, southwest China and northwest China. The construction of this station has greatly relieved the transportation pressure of Beijing Railway Station. Many trains depart from and arrive at this particular station, transporting more than 100,000 passengers a day. Roughly 200,000 passengers pass through the station during daily peak hours, making it the nation's largest and busiest passenger station. The well-known Jingjiu Railway Line, serving Beijing to Kowloon, begins at this station. The station also has vast parking lots for passenger convenience. Beijing West Railway Station is located in western Beijing's Fengtai district. 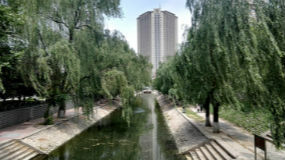 To the south of Beijing World Art Museum and China Central Television Station, there is a well-constructed underground subway network that will be connected with subway Line 9. Inside the public square, public transportation lines take passengers to each of the urban districts. It is undoubtedly an important showcase of complex rail networks in the capital. Beijing South Railway Station is a new and massive railway station on the south side of Beijing. After reconstruction, it became the largest station in Asia, beginning service on August 1, 2008. The new station replaced the old Beijing South Station. The history of this station can be traced back to 1897 in the Qing Dynasty (1644-1911), when it was called Yongdingmen Railway Station or Majiabao Railway Station. Slow trains arrive and depart from this station. Over 300 pairs of trains arrive and start from this station. This station serves trains running on high-speed railways, including the Beijing-Tianjin Intercity Railway, the Beijing-Shanghai High-Speed Railway and direct trains to Jinan and Qingdao. The trains can reach speeds above 350 km/h. It only takes half an hour and five hours, respectively, from Beijing to Tianjin and from Beijing to Shanghai. The new Beijing South Railway Station is situated at the border of Xuanwu, Chongwen and Fengtai districts. The new station houses five stories, two aboveground and three underground. The second underground floor and the third underground floor are, respectively, connected with subway Line 4 and Line 14 stations. Passengers can transfer to the subway trains without transferring out of the railway station. Beijing North Railway Station, formerly known as Xizhimen Railway Station, is a railway station in Beijing, China. It was built in 1906 during the Qing Dynasty (1644-1911) as one of the original stations on the famous Beijing-Zhangjiakou Railway, the first railway in China. The railway starts from this station and provides important access to northwest Beijing. The railway and station were both designed and inspected by Zhan Tianyou, China's first railway engineer. Beijing North Railway Station is a small station (Tier-III) managed by the Beijing Railway Bureau. It provides regular intercity train service to the north and northwest. It also services tourist trains to Beijing's suburbs and nearby locations. It also provides short-distance trains from Beijing to Hebei province and the Inner Mongolia autonomous region. Beijing North Railway Station is a rather small station. It is located north of the Xizhimen subway station and accessible by Lines 2 and Line 13 of the Beijing Subway. There are also numerous city bus lines that reach Beijing North Railway Station. At present, this station is under reconstruction, and only a few trains arrive and start from here. In the future, it will be larger and more modern.